Have you seen the limited edition larabar? Pineapple Coconut Cake Larabars. As soon as I heard about them, I had to create a homemade version. 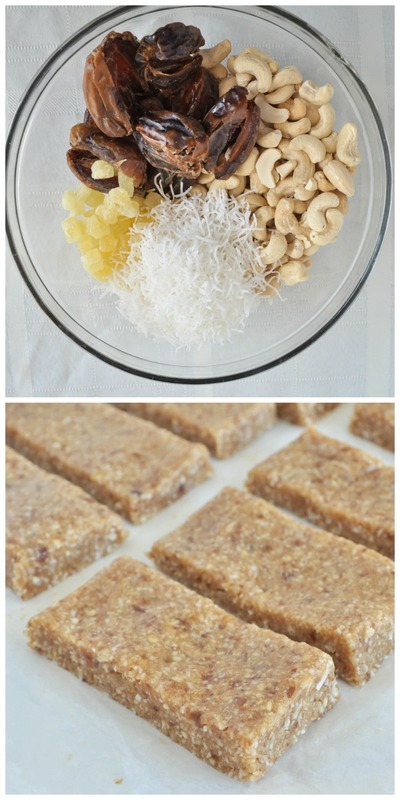 If you like my Coconut Cream Larabars, you will love these Pineapple Larabars as well! They are no bake, vegan, gluten free and paleo. Whip them up in minutes. If you like these, you may also like this post. 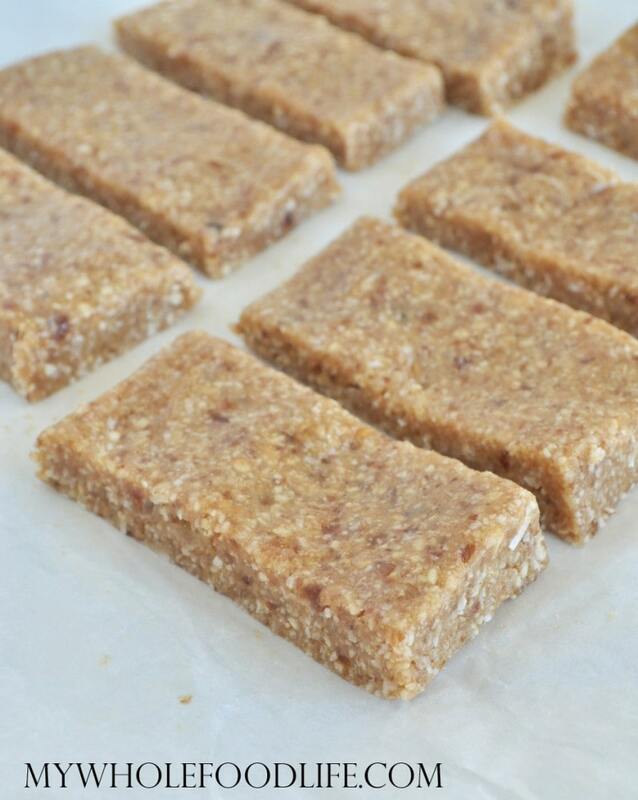 A healthy snack that tastes like dessert! In a food processor , grind up the cashews for a minute. Then add in the remaining ingredients and mix until a dough forms. Line an 8x8 glass baking dish with parchment paper. Press dough into the baking dish . The dough is thick and sticky and sometimes wetting a spatula helps. If you prefer, you can roll these into bite sized balls and place on a lined baking sheet. Once the dough is in the baking dish, transfer it to the fridge to set. It should not take long at all. Once the bars are firm, use a pizza cutter to cut into bars. Keep these bars stored in the fridge. They should last several weeks that way. You can also freeze them for much longer. Enjoy! I have a question about the dried pineapple. The only type I can find is always sweetened with sugar. Is there a brand that doesn't add any sugar to their dried pineapple? Which do you use and where do you find it? I buy a dried pineapple that has been sweetened with fruit. I get it at Natural Grocers. I think Eden Foods makes some too. Trader Joe's carries unsweetened dried pineapple- it is delicious! Vitamin Cottage also carries unsweetened dried pineapple. These sound so yummy! I love anything with coconut. Totally making a batch of these tonight since I just ate my last one from the store. Seriously my new favorite flavor. sooooooooooooooooooooooooooooooooooo good! Yay! I hope you like my version. Thanks I will be making these, do you know how much protein might be in a serving? Ivana - I was wondering the same thing. Were you able to find out how much protein were in these? Thanks! Your welcome. I'm loving My Fitness Pal. They make it so easy to plug in a recipe by coping over the web link and it imports it from the page. It works very well for anyone interested. Melissa, can't wait to try these bars (Lara are my favorite). Could I get the weight or a cup measurement on the dates please. On my way to Natural Grocers for the pineapple. Thanks for the recipe! If I had to guess a cup measurement for the dates, I would guess about 1 1/4 cup? Just made these. They are my favorite so far! The fresh lime juice just makes it yummy! Melissa, these are excellent. I love the subtle tartness of the lime. Thanks. I had not seen them but now I've heard about them I want one...... It's a good job I have a recipe right here!!!!! Can't wait to try these! Would fresh pineapple work? I have the same problem as someone else mentioned with finding dried fruit not sweetened with sugar. I think fresh pineapple could work. Let me know if you try!